Six of Australia’s most strategic funders were recognised for the impact of their giving at the 2017 Philanthropy Australia Awards in Melbourne on Wednesday night. The Awards – an initiative of Philanthropy Australia – celebrate innovative partnerships between grant-makers and not-for profits, highlighting the significant achievements of projects that help solve complex societal issues. 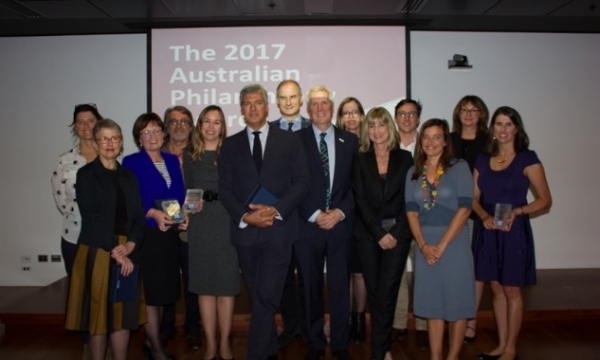 Sarah Davis, CEO of Philanthropy Australia, said the Awards provided an important opportunity to recognise the unique accomplishments of those who are working to create lasting and positive change, both in Australia and abroad. “Although Australian philanthropic organisations stand at the forefront of innovation, their important work is often done behind the scenes. The Awards showcase the many impressive examples of great leadership in philanthropic giving,” said Davis. Selection criteria focused on visionary, high impact and transformative philanthropy, defined by commitment, courage, and entrepreneurship. • 2017 Environmental Philanthropy Award: The Ian Potter Foundation (Melbourne) for the Reef Life Survey, Tasmania. The Funding Network (TFN) was honoured with the ‘Best Small Grant Award’ in recognition of its collaboration with non-profit organisation Manjeri, to support their work in Uganda. The partnership began in 2014 when TFN, whose mission is to build the capacity of grassroots non-profits by helping to democratise giving and facilitating greater community engagement, awarded Manjeri an initial grant of $17,900 to fund their work in Uganda, leveraging the power of social enterprise to build sustainable schools.